Our School has a team of well qualified and dedicated teachers headed by an able Headmistress. 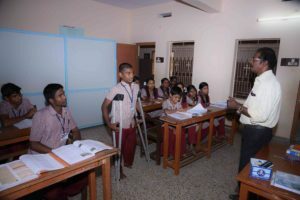 The school conducts special classes, and evening classes to the students. So we proudly say that this school gets 100% result not only in X & XI std but also in XII std every year. This school maintains 100% result in public examination till now. ( Continuous, Comprehensive assessments) periodical parent – teacher meetings, special attention on the slow learners, counselling – guidance and extra – coaching with the help of experienced teachers form part of our academic schedule.